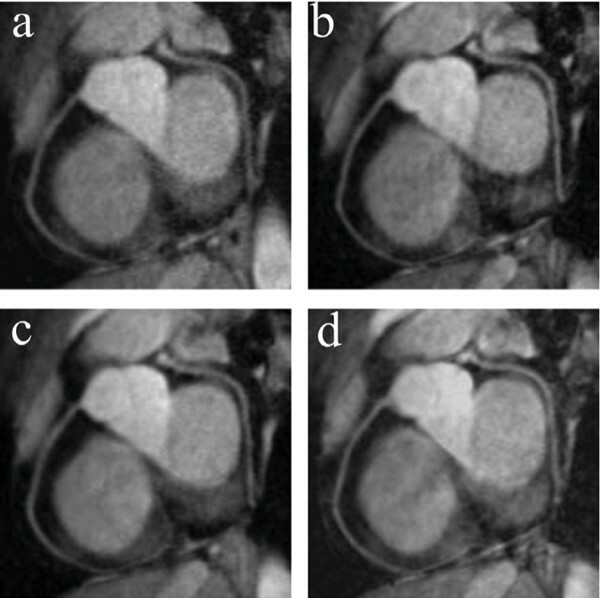 In coronary magnetic resonance angiography (MRA), image data are typically collected during a short acquisition window (ACQ window) to minimize motion artifacts. This requirement limits the number of radiofrequency (RF) excitations per ACQ window and leads to prolonged scanning time. This could be addressed by shortening the repetition time (TR). Unfortunately, to shorten TR, shorter and stronger readout gradients are necessary and the subsequent increase in bandwidth results in a signal-to-noise ratio (SNR) loss. Alternatively, scanning time can be shortened through parallel imaging (SENSE) thus permitting the use of lower bandwidth and readout gradients with improved SNR. To investigate whether the use of SENSE can be exploited to improve SNR in coronary MRA. 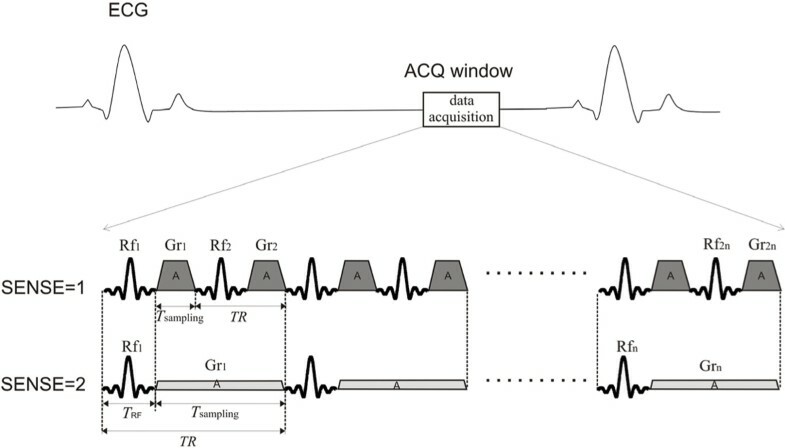 When reducing the number of RF excitations by a certain factor while keeping the ACQ window constant, the TR can be prolonged. With a prolonged TR, weaker readout gradients can be employed which increases the SNR at the expense of scanning time. This extra scanning time can be compensated for with SENSE  The SNR gain secondary to the reduced readout bandwidth is expected to be offset by the SNR loss associated with SENSE. 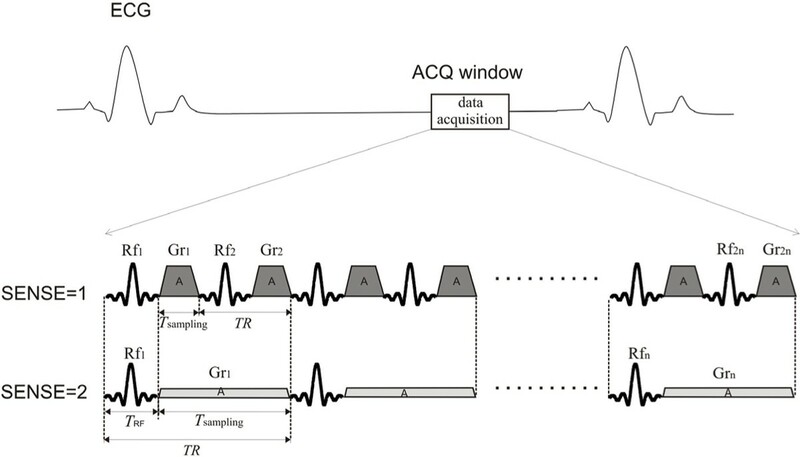 However, by removing RF excitations, extra time in the ACQ window is made available that can be used for signal sampling rather than for RF transmission (Figure 1). In theory, this can be exploited to gain additional SNR in coronary MRA. Schematic of a baseline (SENSE = 1) and a SENSE accelerated (SENSE = 2) coronary MRA pulse sequence. Rf = radiofrequency excitation, Gr = readout gradient, A = area under the gradient. During one RR internal, several k space lines are acquired during the acquisition window (ACQ window). In the case of SENSE = 2, the number of RF excitations is reduced by 50%, TR is doubled, the readout gradient is reduced and the readout bandwidth is smaller. Note that the sample time (Tsampling) increases more than twice. Trf = duration of RF transmission, Tsampling = duration of the signal sampling period. A numerical simulation of the Bloch equations was implemented in Matlab in order to compute the SNR as a function of the SENSE factor (1.0 and 2.0) and the ACQ window (40 ms and 70 ms). An in vivo study was then performed on a commercial 3 T MR system (Philips Achieva) using a 6-element cardiac coil. For SNR quantification on SENSE images, an additional 3D noise scan without RF excitations and gradients was implemented. Ten healthy adult subjects (28 ± 8 years) underwent navigator-gated free-breathing 3D coronary MRA of the right coronary artery (RCA) (FOV 360 × 360 mm2, matrix = 516 × 362, RF excitation angle = 20°, slices = 10, slice thickness = 3 mm, T2Prep ). Four coronary MRA data sets were collected in each subject with different SENSE factors and ACQ windows (Table 1). On the resultant images, the signal intensity (SBlood) was measured in a region of interest (ROI) in the ascending aorta. This ROI was then copied into the corresponding noise scan for noise quantification (SDNoise). SNR for the different scans was computed (SBlood/SDNoise) and a two-sided t-test as well as a linear correlation were used for statistical comparison. Some imaging parameters for SENSE = 1 and SENSE = 2 scans. Baseline scanning (Scans 1, 3) with a SENSE factor of 1 was performed using 12 RF excitation per RR interval. Two additional MRA (Scans 2, 4) at the same anatomical level but with a SENSE factor of 2 and 6 RF excitations only were also acquired. The numerical simulation predicts an SNR increase (SENSE factor 2 vs. 1) of 52% for a 40 ms ACQ window and 11% for a 70 ms ACQ window. These findings were confirmed in vivo where a 55 ± 10% increase in blood SNR was obtained for an ACQ window of 40 ms (85.2 ± 23.9 vs. 54.8 ± 14.3 (p < 0.0001)) by using a SENSE factor of 2 vs. 1. For the prolonged acquisition window (70 ms), the 11 ± 10% SNR gain for a SENSE factor of 2 versus 1 (114.0 ± 29.2 vs.101.7 ± 21.0 (p < 0.005)) was also significant and consistent with the theory. The SNR between baseline scans and SENSE accelerated scans was strongly correlated (r2 = 0.96 and 0.86 for 40 ms and 70 ms ACQ windows respectively). Representative images of the RCA are shown in Figure 2. 3D MRA of the RCA of one volunteer reformatted with the "Soap Bubble" software. ACQ window 40 ms baseline (a) and SENSE = 2 image (b), ACQ window 70 ms baseline (c) and SENSE = 2 image (d). Both SENSE = 2 images have enhanced SNR and improved visual vessel conspicuity. We demonstrated that a reduced number of RF excitations and parallel imaging can be exploited to improve the SNR in coronary MRA with short ACQ windows. For ACQ windows of 70 ms and longer, this SNR benefit is small. However, for shorter acquisition windows, the gain is considerable. This may have important implications when trying to further reduce motion artifacts through shorter ACQ windows in coronary MRA .